LAS VEGAS–Minoo Mehta has been attending the Specialty Equipment Market Association Show for more than 30 years. This year’s event, however, felt quite a bit different for the president of BKT USA Inc., the U.S. subsidiary of Mumbai, India-based Balkrishna Industries Ltd. (BKT). Not only was Arvind Poddar, managing partner of BKT, inducted into the Tire Industry Association’s Hall of Fame–becoming just the third Indian to receive the honor– Poddar revealed in his videotaped acceptance speech that the off-highway tire specialist company was planning to build a U.S. tire plant. The $100 million factory will be BKT’s first outside of India and fifth tire plant overall. BKT also disclosed recently investments of more than $200 million to upgrade and expand capacity for tires and carbon black at its plants in India, projects that will overlap with and supply the U.S. plant when it comes on stream. BKT is India’s fth largest tire maker and ranks No. 39 worldwide on Rubber & Plastics’ 2018 Global Top 75 rankings, based on fiscal 2017-18 sales of $692 million. To move the project forward, BKT will establish a new subsidiary in the U.S. Its first undertaking will be to select an appropriate site for the plant and acquire 120 or more acres, which should be finalized by the end of 2019’s first quarter. Mehta said 40 sites are under consideration in several states, including Georgia, Mississippi and South Carolina, states where several plants have opened recently or are under construction. Sites in Alabama, Indiana and Kentucky also are being considered. The list of sites will be whittled to four, from which one will be chosen by January, according to Rajiv Poddar, joint managing director of BKT, who accepted the Hall of Fame plaque in place of his father, who was unable to attend the ceremony due to the recent death of his uncle. The younger Poddar said he expects site preparation to take three to four months from the day they select the land. The target date for the plant to open, he said, is 24 months from the groundbreaking–at this point, the second quarter of 2021. Mehta said BKT is considering several factors in its site selection process: qualified labor, a strategic location and transportation, among them. BKT said the plant will have nameplate capacity of 20,000 metric tons per year, smaller than any of the company’s four plants in India. By comparison, the company’s newest factory, in Bhuj, Gujarat, India, is rated at 130,000 tons per year. 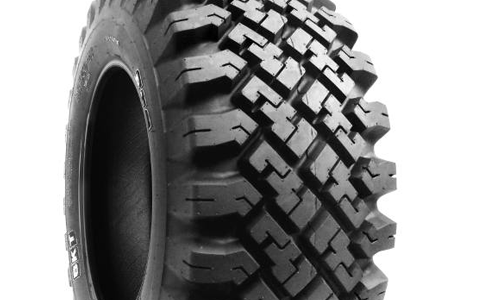 At first, BKT plans to manufacture its entire line of ag radials at the new plant before expanding capacity to include tires from other segments. While that promises to be a huge cost savings, another benefit of building of a U.S. plant can’t be measured. Mehta said all the capacity that BKT recently added–including 400,000 square feet to the plant in Bhuj–has been utilized. BKT has expanded the range of giant tires produced at its Bhuj plant, which in late 2015 rolled out the company’s rst all-steel radial giant tire–the Earthmax SR45 plus R49. Other giant tires, also in 49-inch rim diameters, also are being made there, Poddar said. Plans are in the works to manufacture 51- and 57-inch tires–in the second quarters of 2019 and 2020 respectively–at the plant. BKT also is building a carbon black plant on property adjacent to the Bhuj plant. The new plant, rated at 140,000 metric tons a year at full capacity, will supply the new U.S. plant in addition to BKT’s Indian facilities, BKT said. The carbon black plant, for which BKT has budgeted $61.6 million, will start producing at an annualized rate of 80,000 tons when complete in March, and it will ramp up to full capacity by March 2021. Poddar said BKT considered factory integration in its decision to build a carbon black factory. Company officials decided they didn’t want to venture into distribution, as other manufacturers have. “We have our partners, and we rely on them,” Poddar said. So the company went backwards, so to speak, deciding the next step was to produce its own carbon black. “That’s how we decided to do it,” he said. Mehta said the carbon black plant will be almost completely sustainable–some of the byproducts from carbon black production will be used to replace coal currently being used as fuel. BKT also has budgeted $145 million for two other projects in India–$72.5 million to replace a 30-year-old farm/industrial/OTR tire plant in Waluj, Maharashtra, and $72.5 million to add 5,000 metric tons of annual capacity at the Bhuj factory, in particular for larger sizes, along with a rubber mixing plant and additional warehousing. The increased mixing capacity also will be used to supply the U.S. plant. BKT said its sales of $692 million represent about a 6-percent share of the global off-highway tire business. The company’s goal is 10 percent by 2025. About 85 percent of the firm’s fiscal 2017-18 revenue was generated in markets outside of India, including roughly $93 million in North America, according to BKT’s financial reports. Mehta said he believes BKT is “very close” to the top brand in the ag segment, Firestone. With the ag market at, BKT said its ag sales are growing 25 to 30 percent annually. “We have bridged the gap between the prices of Firestone and us over the last four years ago,” Mehta said. Bruce Davis,Tire Business’ Special Projects Reporter, contributed to this report.